My work focuses on exploring the unusual evolutionary adaptations undertaken by creatures that reside in inhospitable conditions. I create analogous ecosystems in my installations and populate them with organic living things made from common, everyday objects. I source my wholly synthetic materials from the mundane objects that comprise our modern existence: household appliances, zip ties, water tubes, lights, computer parts, cheap motorized toys, and the like. 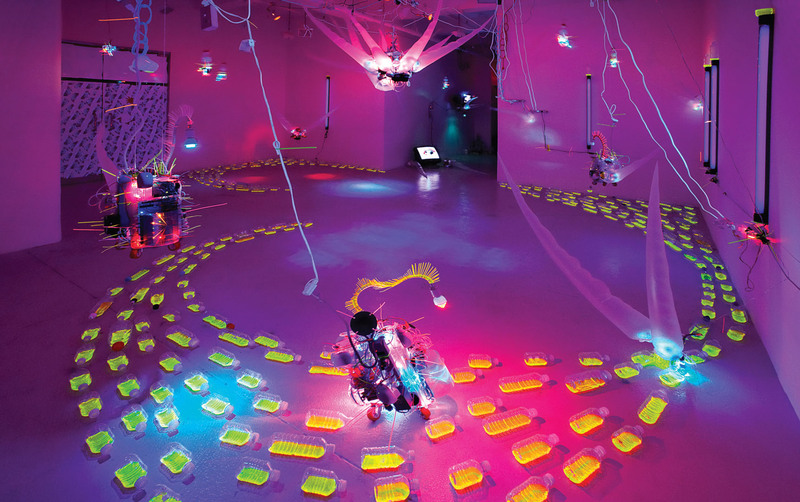 The objects are dissected and disassembled as needed and reconstructed into experimental primitive organisms that reside on the fringes of evolutionary transformation: computer cooling fans are re-purposed for locomotion, Tupperware serves as a skeletal framework, a guitar tuner is rewired to detect sound, and automatic night lights become a sensory input. Exhibition of this work is made possible by the Council for Cultural Affairs, Taiwan, R.O.C., and Taipei Cultural Center of TECO in New York.